The Clorox Direct Stock Purchase Plan (DSPP) is a direct stock purchase and dividend reinvestment plan that provides a simple and economical method for investors to make an initial investment in shares of The Clorox Company common stock or to increase their existing holdings of Clorox common stock. Call Computershare at (877) 373 6374. Use voice commands to state "I am not a shareholder" and "Request plan materials" to speak to a representative. Everyone is eligible to participate. No prior stock ownership is required. The plan provides a systematic and simple way for you to invest in Clorox stock without paying brokerage commissions and most administrative services charges. Every invested dollar produces additional cash dividends because dividends are paid on both full and fractional shares owned. Automatically build your investment over time. Your dividends will be reinvested, and if you wish, you can buy additional stock with automatic monthly deductions from your bank account or by check. Your record maintenance is simplified through an account statement mailed to you by Computershare after each investment in your account. 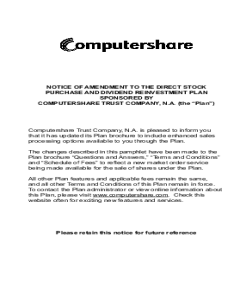 As long as you are a DSPP participant, Computershare, as your agent, will hold your stock certificates in safekeeping. This provides protection against loss or theft. If you prefer, certificates for full shares credited to your account will be delivered to you. 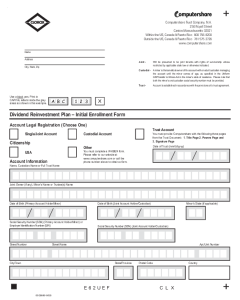 Reinvested dividends are subject to income taxes as if they were paid to you in cash. You can make voluntary cash payments or automatic debits from your bank account in any amount from a minimum of $50. You can also reinvest all or part of the cash dividends of your Clorox Common Stock. Maximum Purchase: $250,000.00 Per Year.